Brad McAlpine was commissioned through the Air Force ROTC program at Pennsylvania State University on May 13, 1994, and went on active duty beginning in October 1994. 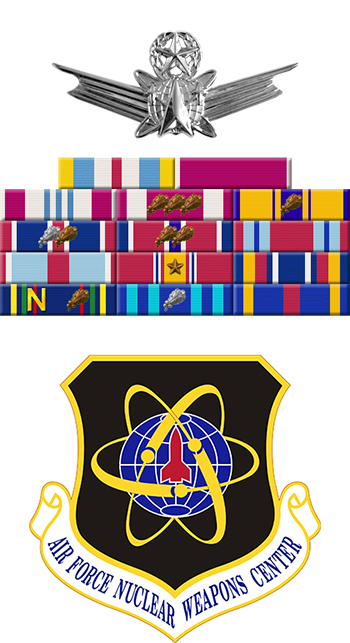 Lt McAlpine next completed Undergraduate Missile Training on the Minuteman III intercontinental ballistic missile (ICBM) at Vandenberg AFB, California, in February 1995, followed by service as a Minuteman ICBM Crew Commander, Assistant Flight Commander, and then Instructor Crew Commander with the 341st Strategic Missile Wing at Malmstrom AFB, Montana, from February 1995 to May 1999. His next assignment was as Chief of Training and as Base Executive Officer with the 21st Space Operations Squadron at Onizuka AFS, California, from May 1999 to June 2001. Capt McAlpine was a student in the Air Force Intern Program in the Office of the Secretary of Defense and Air Staff with Headquarters U.S. Air Force in the Pentagon from June 2001 to June 2002, where he earned his Master of Arts in Organizational Management at George Washington University, and then served as Chief of Emergency War Order Plans and Flight Commander of Emergency War Orders with the 91st Operations Support Squadron at Minot AFB, North Dakota, from July 2002 to July 2004. Maj McAlpine attended the Air Force Institute of Technology at Wright-Patterson AFB, Ohio, from July 2004 to June 2006, where he earned his Master of Science in Systems Engineering, followed by attending the School of Advanced Air and Space Studies at Maxwell AFB, Alabama, from June 2006 to June 2007, where he earned his Master of Airpower Art and Science. His next assignment was as Special Assistant and Senior Executive Officer for the Deputy Under Secretary of the Air Force for International Affairs at the Pentagon from June 2007 to June 2010, and then as Chief of Strategic Studies in Doctrine and Policy with Headquarters Air Force Space Command at Peterson AFB, Colorado, from June 2010 to June 2011. LtCol McAlpine served as Commander of the 335th Training Squadron at Keesler AFB, Mississippi, from June 2011 to July 2013, and he is currently serving on the faculty of the Naval War College in Newport, Rhode Island. His achievements include: Honor Graduate, Undergraduate Missile Training in 1995; awarded the Air Force Association's General Thomas S. Power Award for Best Missile Crew of the Year in 1999; and he was named Space Operator of the Year at Onizuka AFS in 1999. Brad is married to the former Eleanor M. Camp and has two daughters, Azalee and IsaBelle. 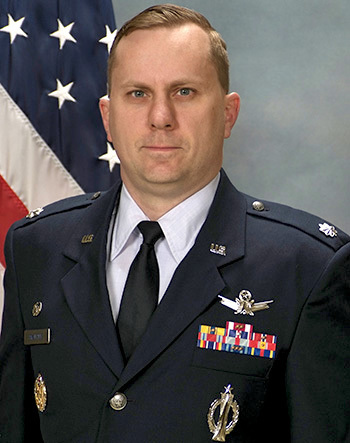 Lieutenant Colonel Bradley M. McAlpine distinguished himself in the performance of outstanding service to the United states as special Assistant and Senior Executive Officer, Deputy Under Secretary of the Air Force, International Affairs, the Pentagon, Washington, District of Columbia, from 22 June 2007 to 23 June 2010. During this period, Colonel McAlpine's keen vision and demonstrated acumen enabled him to provide expert insight into strategic issues throughout his tenure. He was the visionary architect of the new United States Air Force global Partnership Strategy, a seminal document responsible for defining building partnerships as a core Air Force function. In addition, Colonel McAlpine was instrumental in developing and synchronizing strategic messages from Headquarters Air Force on a variety of international issues, including Iraq and Afghanistan. His leadership, strategic, and tactical skills were again displayed in his oversight and implementation of Executive Services reorganization, consolidating disparate services from throughout this 200-person organization and developed them into a coherent and focused team. Above all, Colonel McAlpine continually provided sage advice and invaluable support to the Deputy Under Secretary of the Air Force, International Affairs. The singularly distinctive accomplishments of Colonel McAlpine reflect great credit upon himself and the United States Air Force.